This week, the private corporation Space X announced that they will be working toward a launch system that allows them to recover the 1st and 2nd stages of their rocket, as well as the crew or cargo module. This is being done in an attempt to further lower the cost of launching material and crew into orbit. Space X already publicly boasts the lowest cost to orbit prices available in the world today due to their vertical integration and parts designed for simplicity and reliability. 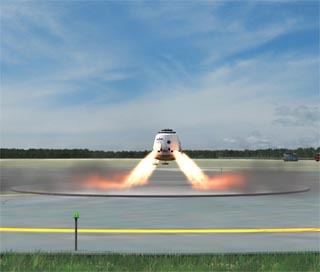 While Space X already recovers some of it’s launch stages by parachute, this new program will be using an active braking thrust system similar to what was used to land the astronauts on the Moon. Space X is known for their ability to actually produce and launch craft that do what they claim so we will have to see exactly when they plan on having this new recovery system available for use. Space X is currently the lowest cost solution to launching material into space and actually includes a best price guarantee. They also do something unprecedented in space flight, if there should be a cost overrun then Space X pays for the cost overrun and not the customer. This business model has landed them the largest ever launch contract from Iridium for $492 Million to launch satellites that provide satellite to ground communication to areas of the world that cannot be easily reached through land lines. 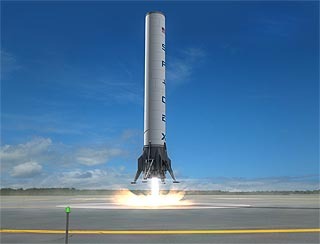 Space X has also landed a dozen other contracts to launch satellites and even a privately funded space station in 2014. Low cost per pound launched is one of the most essential goals of a rocket today and being able to re-use rocket parts should continue to lower Space X’s costs while making it both more profitable and popular. Braking rockets have been used successfully in the past to land spacecraft on the Moon and the Earth. This technology isn’t new, but it is a complex way to land something. Space X seems to be heavily relying on braking rockets to gently land large sections of rocket on a small landing base. Currently no other country of corporation uses this type of recovery mostly because of the difficulties involved. There is a limited amount of propellant for the braking rockets and if that should run out in any of them, it means destruction of the rocket. It is only with the use of modern computers, altimeters, and GPS that such a complex idea can be used successfully. 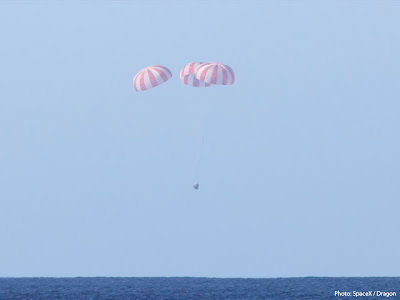 Current recovery systems use parachutes to land rocket parts in the ocean, which are craned aboard waiting ships and shipped for re-fit. Being able to land rocket parts right next to re-fitting stations would save costs of recovery crews, specialized recovery equipment, and transportation fees. See this extremely well done video of how this will work. Good luck to Space X because this type of technology will further increase the ability to launch cargo and people into space cheaply.